The settings dialog contains several tabs with specific settings under each one. This page describes the Tracked Driver tab. The tracked driver feature allows you to add drivers to what we call your 'tracked' list of drivers. This is intended to be a list of drivers you feel you can race closely with, or drivers who you need to give a bit more room to when racing. This tab lets you view those drivers on the list, to remove drivers from the list, and to adjust settings for the display of those drivers. 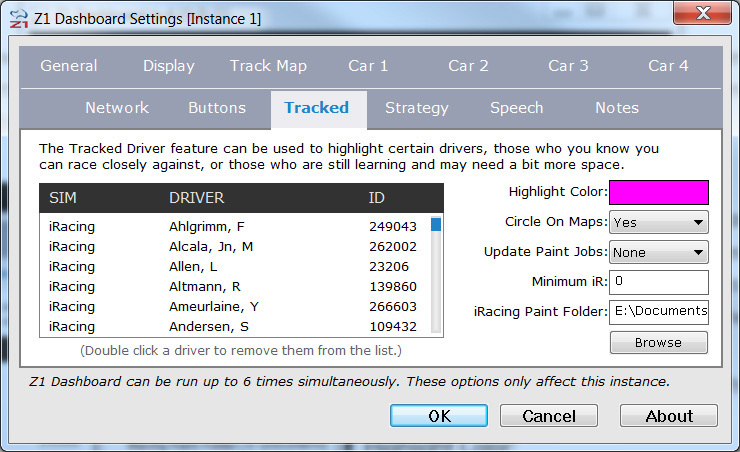 The driver list displays the names of each driver who is on your tracked driver list. You can have different drivers for each sim. The name of the driver, the name of the sim, and if appropriate their ID, is displayed in this list. Use the scroll bar to view the entire list if it is bigger than the display area. You can remove a driver from the list by double clicking on their name. This is the color used to indicate a driver is on your tracked driver list in dashboards such as the Standings dash or the Ahead/Behind dash. Click on the swatch to display a color chooser to change the color. If this is set to Yes then any driver who is on your tracked driver list will have an extra circle displayed around their car dot on the track maps. The color of this circle will be the Highlight color above. This is for iRacing only. You may choose to replace a driver's paint job on the car with a solid color if they are on your tracked driver list. This makes the car very easy to see on the track. The paint jobs are updated when you exit the Z1 Dashboard. Selecting All from the drop down will update all the drivers on the list. Selecting Changes will only update those drivers who were newly added to the list, and is much faster. However if you use software such as Trading Paints to keep your paint jobs up-to-date then you may want to use the All option to make sure the tracked driver's paint jobs are not overwritten by Trading Paints (or other software). Selecting None disabled this feature. This is for iRacing only. You can specify a minimum iRating under which a driver is automatically added to your tracked driver list. If the driver's iRating climbs above your minimum then they will be removed from your tracked driver list. This is for IRacing only. In order for the paint job updates to work the Z1 Dashboard needs to know where your iRacing paint folder is located. By default this is: Documents\iRacing\paint. If you need to change the location click the Browse button to select the new location.